Boat sales regained some momentum in July, settling into a healthy pace of growth and providing more clues about the geography and durability of the industry’s recovery. Aluminum pontoon and fishing boats continued to be reliable gainers, but the best-performing category in the industry’s main powerboat segments was the high-volume 11- to 40-foot outboard fiberglass category. Sales in that segment rose 20.5 percent in July, to 2,783 boats, from the same month a year earlier, according to figures compiled by Aarn Rosen, national sales manager at Statistical Surveys Inc. Through July, sales are up 14.1 percent. Pontoon boat sales rose 12.6 percent in July, to 2,666, and fishing boat sales rose 5.3 percent, to 1,801. For the year, pontoon sales are up 25.7 percent and fishing boat sales are up 11.7 percent. Categories of smaller boats generally fared better than larger ones in July, but the industry’s gains did not appear to extend to the 14- to 30-foot inboard and sterndrive fiberglass category. Sales there were 8.6 percent lower, at 1,442 boats, marking the fifth month in a row that sales were flat or lower in that category. For the year, sales are nearly flat. “It may be that the segment had more inventory to work out of the system,” says Rosen, who attended Nautic Global Group, Rec Boat Holdings and Skiers Choice dealer meetings this summer and says he heard consistently positive reports from dealers who told him they were replenishing their stocks. Sales of larger fiberglass boats were generally lower. The 31- to 40-foot cruiser category had 11 fewer sales than in July 2011, and the 41- to 62-foot yacht category had seven fewer. Sales of 63- to 99-foot yachts rose by a single boat to 19. 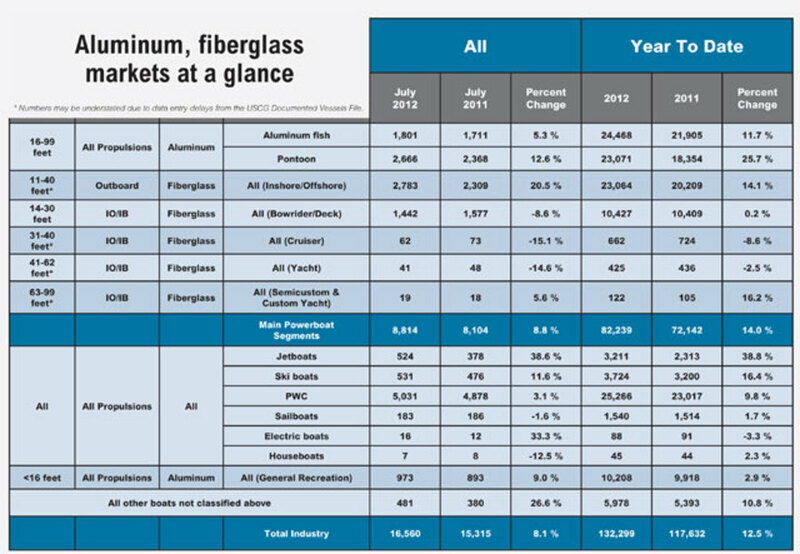 Sales in the main segments, which include the two aluminum categories and five fiberglass boat groups, rose 8.8 percent for the month, to 8,814 boats. Industrywide sales were 8.1 percent higher at 16,560. June’s gains had been lower: 6.1 percent in the main segments and 5.3 percent industrywide. For the year, sales are up 14 percent in the main segments and 12.5 percent industrywide. The data for July were based on information from 26 early reporting states that comprise about 57 percent of the U.S. boat market. July sales represent 13 to 14.8 percent of the total annual market. Reported sales of documented vessels were complete only through May 31 because of data entry delays at the Coast Guard, Rosen says, which means sales totals for boats 30 feet and larger are significantly understated. Sales of jetboats continued to surge, gaining 38.6 percent, to 524, after a gain of 53.4 percent in June. Sales of ski boats rose 11.6 percent, to 531, and sales of PWC were 3.1 percent higher, at 5,031. Sailboat sales fell 1.6 percent, or three boats, to 183. They are 1.7 percent higher for the year.